4 bdrm / 4 bath - 2 king master suites - sleeps 10 - 5 minute walk to mountain! Ski Season: Book now for Ski Season! Repeat guests, please remember to contact us for our repeat guest discount. We are now taking reservations for 2020 Ski Season - popular times fill up quickly, so don't wait! Summer: Summer is Steamboat's best kept secret! So many events and activities for all ages - from hiking, mountain biking, hot air balloon festival, rodeo, horseback riding, Alpine slide, Steamboat Lake, Steamboat Hot Springs, river rafting, fly fishing, wildflower hiking, and more! Our condo is the perfect location to easily access all of this - plus we have AIR CONDITIONING, outdoor pools and we are right on the paved bike path. Fall: Fall is a great time to visit Steamboat and enjoy the hiking, biking and beautiful changing leaves! We offer discounted Fall rates! We value our guests! Our condo is owner-managed. Please check out our excellent reviews and feel free to contact us for more information if you have any questions about our property. We invite you to enjoy our wonderful condo and fantastic amenities at our home away from home at Emerald Lodge in Steamboat! One of the newer properties in Steamboat, Emerald Lodge at Trappeur's Crossing Resort is Steamboat's ultimate resort experience. Our Condo is PLATINUM-rated, marked by unique design and luxury features. It is rated “One of World’s Best” on Expedia Insider’s Select List. Conveniently located in the heart of the Steamboat Mountain Village, Emerald Lodge is just a short, flat, 5 minute walk (or private shuttle ride in winter) to skiing, restaurants, bars, and shops in Gondola Square. The Silver Bullet Gondola is just minutes from your door to give you access to miles of world-class skiing and mountain biking terrain. Or from the condo, enjoy amazing views of the mountains from the living room and balcony while you relax by the fire or while you lounge around the pools and hot tubs. Our condo is within a short walking distance (about 100 yards) of a small grocery, deli, restaurant, liquor and wine store located at the intersection of Apres Ski Way and Village Drive. There is really no need to rent a car because we offer a free on-call private shuttle into downtown Steamboat, to the shops and grocery at the mountain base, and to/from the Gondola if you choose not to walk or have young children in tow. As our guest, you have access to all that Trappeur's Crossing has to offer, including the day Spa, fitness center, indoor pool & hot tub, 4 outdoor pools, 11 hot tubs, and fire pit and the complimentary Happy Hour held at Trappeur's Crossing just across the street. Our home provides both luxury accommodations and a great location. Our exceptional four-bedroom, four-bath condo with 2 master bedrooms features a top-of-the-line, fully-equipped kitchen with slab granite counter tops, stainless steel appliances as well as spacious living and dining rooms with a gas fireplace and large private deck complete with mountain views and a private gas grill. 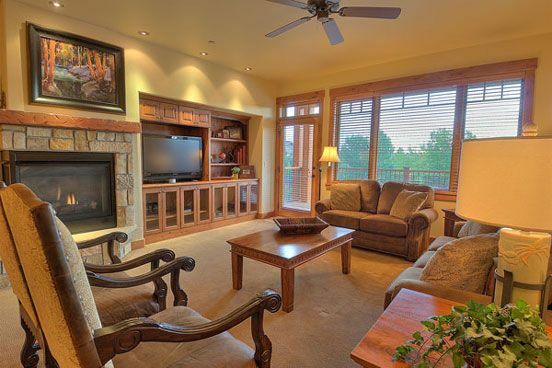 Our condo is professionally decorated in hand-crafted, refined mountain style décor. With 2 master suites complete with luxurious private bathrooms, this condo provides the ideal space for 2 families or large groups. Each of the four bedrooms has its own private, spacious, bathroom and all beds have plush down comforters. Bedrooms are equipped with a flat screen tv, DVD player and stereo with i-pod/MP3 docking station. The master bathroom also has a jetted spa tub. Other amenities include an in-condo washer and dryer, private ski-lockers, central air-conditioning, on-call private shuttle (winter months) and private heated underground parking. NEW this season: We have added ROKU so guests can access their own subscriptions to Netflix, Hulu, Voodu, Sling, etc... We also offer a full line-up of XFinity HD including HBO and complimentary in-condo XFinity high-speed wireless Internet. Ski Season Shuttle: Our condo is an easy 5 minute walk to the Gondola or choose to take the complimentary shuttle that runs continuously from Emerald Lodge to/from the mountain base during ski hours. The Emerald Lodge complimentary on-call shuttle will take you from your front door to the Gondola or anywhere else you want to go within the Steamboat city limits, including the grocery store or downtown. The shuttle operates from 7am to 11pm daily during the winter months. Our Condo #5204 is 2650 square feet with a maximum occupancy of 10 people. *Queen Sleeper Sofa in the living room. *Pack-N-Play crib and high chair available upon request. Privately owner managed. We take pride in our repeat quests and 30+ 5 star reviews. We look forward to having you as our guests in Steamboat. We own this property and love spending time in Steamboat. When we are not in the mountains, we are happy to share our home away from home with guests. We own and manage this property and it is our own home away from home. Most of our guests are repeat guests, friends and guests via word of mouth. We are proud of our customer service and high standards. When you rent from us, you are not renting just another condo from a large rental pool - you are renting our home. We try to screen our guests to be sure that the property remains platinum level and that our guests take care of our condo as we would when they are there. (Please note that we do not rent to sports teams). Trappeur's Crossing offers 2 weekly complimentary Happy Hours, a fitness center, private on-call shuttle, and multiple pools, sauna, and hot tubs. You have the ability to use all of these facilities while staying in the quieter, more upscale Emerald Lodge just across the street. It is a short walk to the Gondola in winter and right on the bike path in the summer - the perfect location! 4 Luxury bathrooms with granite counter tops and fluffy towels. We have a washer & drier in the condo free for your use. Private, covered, secured, climate-controlled garage. Gas fireplace, large deck with grill and great mountain views. Queen sleeper sofa. Stainless steel appliances, granite countertops, wood cabinets, bar with 4 counter stools. Large dining area comfortably seats 8 at table + 4 at bar counter stools. Comcast cable with premium HD channels, including HBO and XFinity on-demand. Large deck with table and outdoor grill with beautiful mountain views. We have an on-site property manager who will provide additional services upon request - price should be negotiated directly with them (such as daily maid service, grocery delivery, etc...). If you have a special request, they can probably make it happen. Amy was a great host, very informative about the area. Home was great for two families, lots of space and a great deck to soak up the afternoon sun after a day on the slopes. Close to everything and great shuttle service to town, slopes and shops. Condo had everything you could need, well stocked kitchen , lockers for ski gear & a beautiful view. One thing to mention is that it was one toasty place! Being on the second floor keeps it very warm, so just open a window to sleep and all is good! We will definitely return if we go back to Steamboat. The location was perfect and the house was spotless. We had almost everything we needed, however we ran out of toilet paper on the first day so I suggest bringing extra as there was none stocked. Otherwise, everything was amazing and we had a great experience! We had a nice stay. The layout was conducive to gathering and also to privacy. We had a great time and so much snow. Will be going again I highly recommend this condo. Amy was great to work with. Thank you for your review. We loved having you as our guests. Please be sure to contact us next time you travel to Steamboat to receive our repeat guest discount! This condo was just perfect for our large family - my wife and I, our 2 children & their spouses, and our 5 grandchildren. Amy and Mark were wonderful hosts and couldn't have made our stay more enjoyable. Honestly we chose this condo because they offered 2 pack n play cribs and high chairs which saved our kids having to lug them along for our grandbabies. Amy was so helpful in providing suggestions for things to do in Steamboat, transportation, grocery delivery and more. The condo was an easy walk to the mountain, but we usually took the shuttle because it was always right there and the kids loved it. We rented a car but really never needed it. The kitchen was very well stocked which was important for us since we wanted to cook in most nights. They even had a stash of kid size gloves available to use during our stay which we were so grateful for when our 5 year old lost 1 glove on the 2nd to last day! The resort is wonderful with lots of hot tubs and pools for the kids to explore. We will definitely return and would highly recommend this condo to anyone - especially to families! Thank you. A cleaning fee of $300 will be charged for all stays. A non-refundable deposit equal to half of the rental cost is required to reserve the unit. The remaining balance is due 60 days prior to your stay. We value our guests and provide 15% off published rates to our repeat guests. Rates are subject to change. We do not rent to sports teams. Please contact us for pricing on long-term stays.